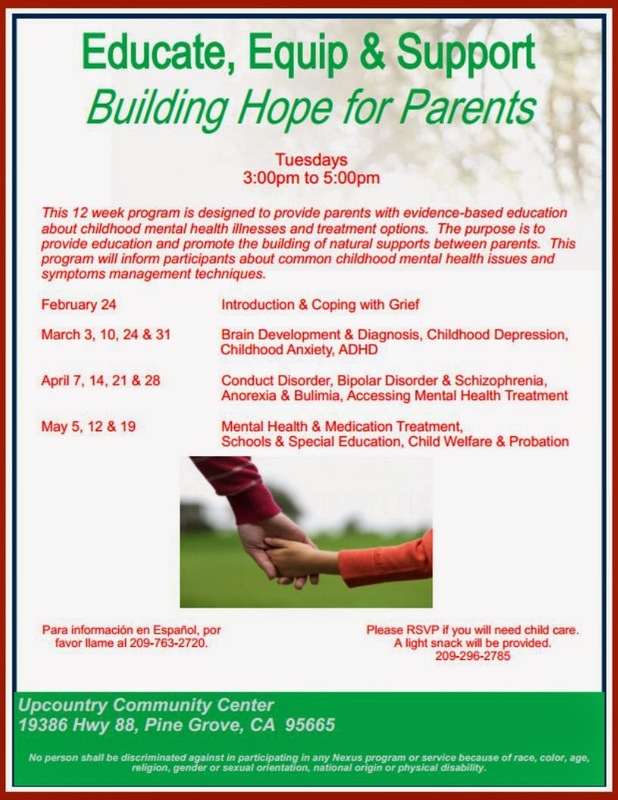 A lot of exciting workshops and upcoming events at your local Family Resource Centers! 17 S. Buena Vista Rd. The 7th International Each Mind Matters Conference, held recently in San Francisco, featured a panel from Amador County, chaired by Christa Thompson, Mental Health Services Act Program Manager and Community Services Manager at Amador Behavioral Health Department. A first for Amador County, the theme of the panel “Breaking the Silence: How a Small Rural County Got Talking” reflected the theme “Together Against Stigma”, with leaders from First 5, NAMI Amador and Mental Health America collaborating in telling the story of history-making large public meetings in 2013-14 where mental illness and mental health services were discussed by citizens and policy makers, along with ideas for reducing the social stigma of mental illness. At the Tuesday, February 24th NAMI Amador meeting, Ms. Thompson will talk about the panel, recounting the impact of members of the faith community, social service agencies, law enforcement, mental health advocacy groups including professionals, families and consumers sitting together and for the first time discussing mental health/illness in Amador County. The presentation is 5:30 – 6:15 in the Meadow Room of Sutter Amador Hospital Outpatient Bldg. and will be preceded by a brief business meeting. Snacks will be available, courtesy of NAMI Amador. 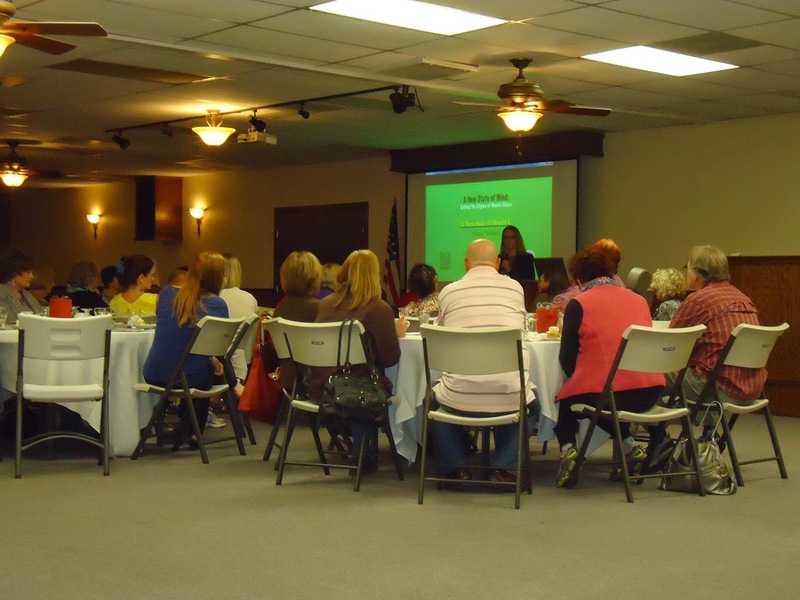 PHOTO BELOW shows part of the audience for the anti-Stigma Dialogue at Thomi’s banquet room in Jackson in October 2013, perhaps the first public discussion of stigma around mental illness in Amador County. Grief and Loss Group for parents who have lost a pregnancy or infant. Call 257-1092 to save your spot. For other events, please visit our Calendar. resources, please visit ourResources Page. Here are three things you can do today to build the father-child relationship you want and your child needs. 1. In the morning, touch physically. Make contact with a pat on the back, a soft hand on the shoulder, or a "good morning" hug or kiss. 2. At noon, touch intellectually. Think about each child. What is he or she going through that day? 3. In the evening, touch emotionally. Ask how he or she is feeling about the day's events. Were there any fears, joys, successes, frustrations, excitements, or disappointments? What was the best thing that happened today (and maybe the least favorite thing)? Listen with a compassionate heart. When appropriate, share your day as well. Why these three? They basically have to do with feeding your child's father-hunger. This is your child's innate and very real need to have an emotional attachment to his or her father. Over the years, I've talked with lots of guys who had experienced an unmet father-hunger growing up. Most didn't have a father who loved them, or they had one who was aloof and didn't "touch" them with any real care and compassion. As a result, they told me they didn't want their children to experience the same hunger. So they pledged to make that important emotional connection with their children. You may have the same determination. If so, tap into your own father-hunger. As a child, where and when was your father-hunger not fed? What worked and what didn't work for you? Then, be the father to your children that you wanted as a child. Using these three ways to "touch" each of your children will help you do just that. ness, but also the most preventable. Since dental health is an indicator of overall health, it's important to take care of our children's teeth and establish healthy habits early. Health teeth and gums start even before your baby is born. Babies' teeth begin to develop between the 3rd and 6th months of pregnancy, making it important for pregnant mothers to take care of their teeth and bodies with a well-balanced diet and good brushing habits. Hormonal shifts during pregnancy can wreak havoc on a mother's mouth and cause pregnancy gingivitis, which results in red and swollen gums that can bleed easily. Resarch suggests a link between preterm, low-birth weight babies, and gingivitis, so see your dentist for regular checkups to ensure a health mom and baby. 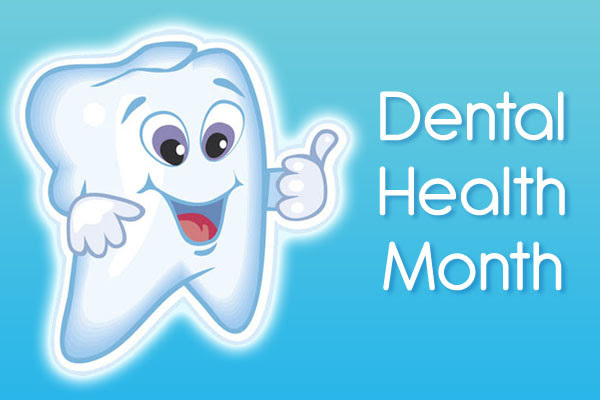 Establishing health habits early leads to a lifetime of healthy teeth and bodies. You can start taking care of your baby's mouth within the first days after birth by regularly wiping their gums with a wet cloth. Once those teeth begin to appear (typically around 6 months), you can begin to brush them with a soft-bristled brush and water. Make sure to brush your toddler's teeth twice a day using a small drop of toothpaste. When they have at least two teeth that touch, you can start to floss. And visit your dentist for a checkup before your baby's first birthday. Sugary beverages can harm teeth and possibly lead to a lifetime of health issues. Tooth decay can impact a child's overall quality of life, inhibit their cognitive and social development, and compromise their growth, function, and self-esteem. Even baby teeth are susceptible to cavities. Maintaining healthy baby teeth is important for children to be able to chew their food and develop language skills. To avoid "baby bottle mouth," avoid putting anything other than breast milk, formula, or milk in their bottles and do not put them down to sleep with a bottle. Children who drink sugary beverages, like soda, have nearly double the risk of tooth decay and an increased risk of obesity and diabetes. So help them stay away from sugary beverages and drink milk and water instead. In order to encourage daily brushing habits, make brushing fun for your kids. Make your own toothpaste with a little bit of baking soda and water. Or have them pick out a flavored one they like. Have them brush their teddy bear's teeth so they see the toothbrush as a fun toy to use every day. 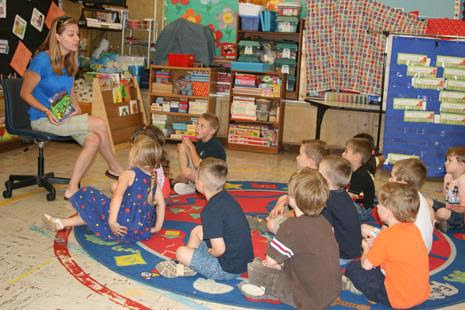 Kickoff to Kindergarten nights are held each year at all six elementary schools within the Amador County Unified School District. During these sessions parents have the opportunity to learn more about the expectations of their children entering kindergarten in the fall. The meetings are facilitated by First 5 Amador's Program Coordinator and either the principal or a kindergarten teacher from the school. Free books to take home along with a lesson on "Dialogic Reading"
This event is geared towards parents and caregivers. Sign-ups are not required, but please call ahead if free child care is needed, at 257-1092. 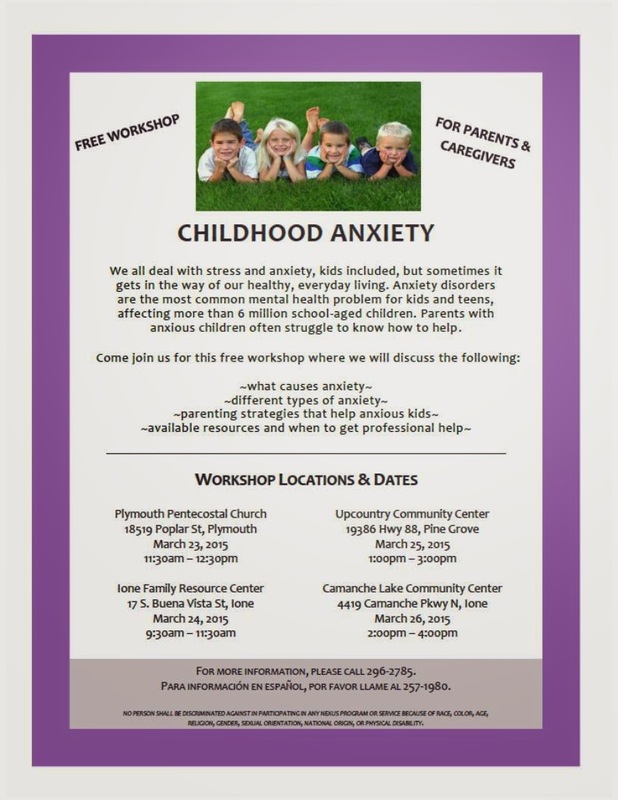 Click here to print out the flyer. children 0-5 years old and their families. 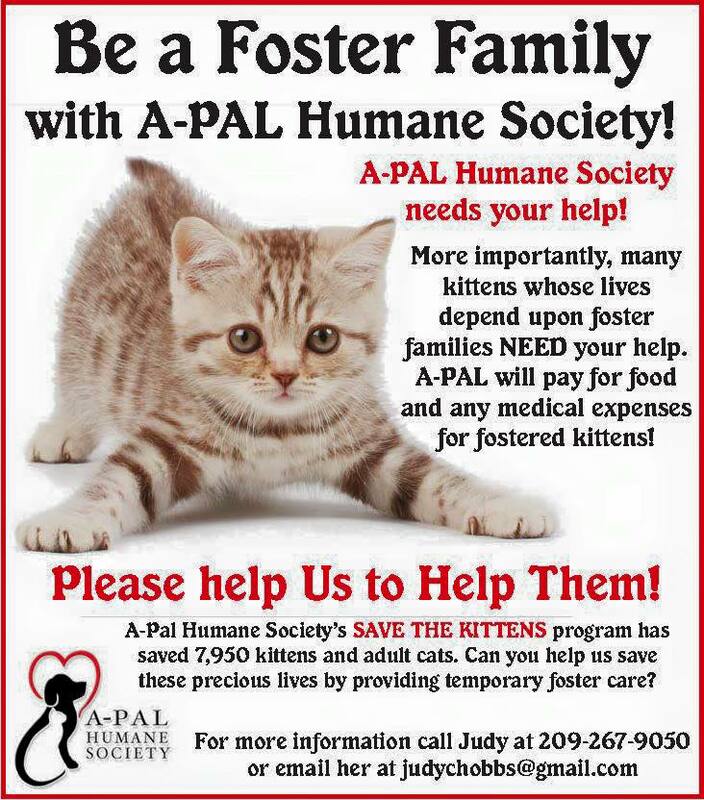 or call us at (209) 257-1092. As a parent, you are your child's first & most important teacher! Save money on books for your children--get them for free! Sign your child up today and start receiving one free book a month from the Imagination Library. 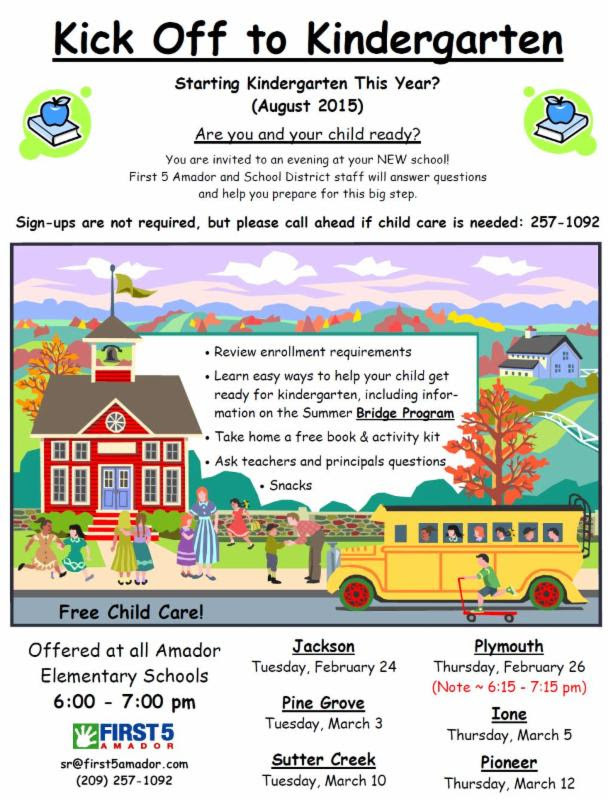 This is a free program, available to all Amador County children 0-4 (from birth until their fifth birthday). All you have to do is read to your child! 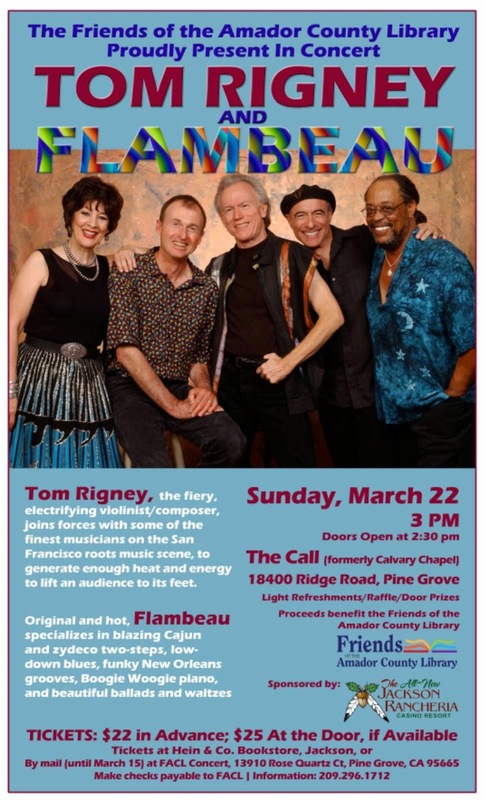 The Friends of the Amador County Library present the fabulous Tom Rigney & Flambeau at FACL's 5th annual concert on Sunday, March 22, 2015, 3:00 p.m., at The Call (Calvary Chapel), 18400 Ridge Road, Pine Grove. Tom Rigney, the fiery, electrifying violinist/composer, joins forces with some of the finest musicians on the San Francisco roots music scene, to generate enough heat and energy to lift an audience to its feet. Original and hot, Flambeau specializes in blazing Cajun and zydeco two-steps, low-down blues, funky New Orleans grooves, Boogie Woogie piano, and beautiful ballads and waltzes. Flambeau showcases Rigney’s passionate, virtuoso fiddling, his commanding, charismatic stage presence, his range and originality as a composer, and, of course, those notorious red boots! Robert Gottlieb of The All Music Guide says of Tom Rigney and Flambeau, “Flair, verve, expertise, and an energy that only comes from love of what you are doing … pulled together by a joy and vision that shines through.” This is a band you have to experience! The event also features door prizes, a raffle and refreshments. Tickets are $22 in advance and $25 at the door (if available). Tickets go on sale February 1, 2015 at Hein & Company Bookstore, 204 Main Street, Jackson. You can also purchase tickets by mail at FACL Concert, c/o Powell, 13910 Rose Quartz Court, Pine Grove, CA 95665. Ticket orders and checks received by March 14 will be mailed; those received after March 14 will be held at Will Call. Please include your phone number with area code and make checks payable to FACL. 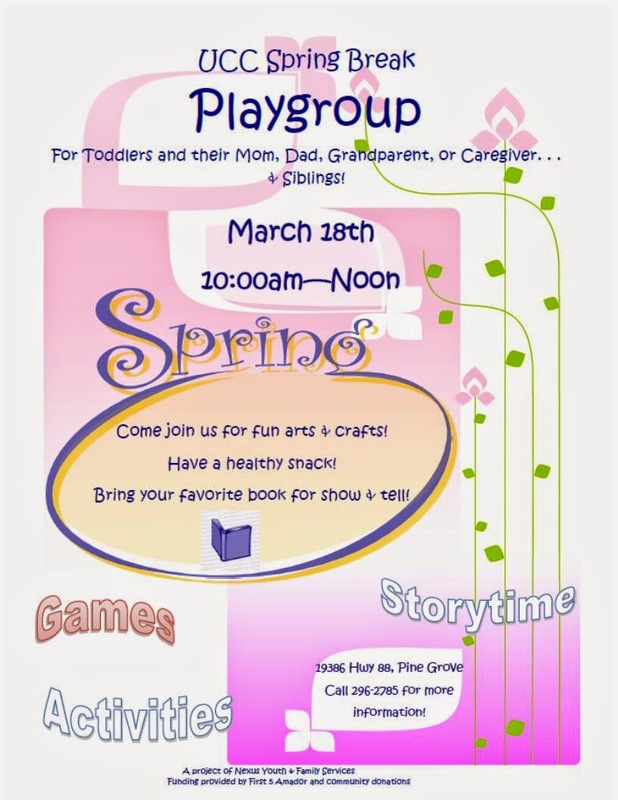 Call 209-296-1712 for more information or visit www.friendsoftheamadorcountylibrary.org. This concert benefits the Friends of the Amador County Library, a non-profit organization dedicated to supporting the Amador County Library, and is sponsored by the Jackson Rancheria Casino Resort. design.fx - Signs, banners, posters, graphics and more! Copyright © by Carol Harper. Simple theme. Theme images by jacomstephens. Powered by Blogger.